I am hoping someone can shed some light on these four mystery tracks. The mystery is not in who is singing. The singer is clearly and recognisably the great Aboubacar Demba Camara. This limits the options when it comes to the orchestra accompanying the man: it is either the Syli Orchestre National or Bembeya Jazz. My guess would be the latter, but both is also a possibility (with the first two songs by Syli National and the last two by Bembeya) . The mystery lies mainly in the origin of these recordings. I have so far been unable to trace when, where and by whom they were made. And the titles are just guesswork, because they were missing on the source cassette (In fact, there was nothing at all on the cassette to indicate its content). So please feel free to speculate. And if you have some expert knowledge, please step forward! EDIT February 21, 2011: Although all four tracks are from the same cassette, the last two appear to be a bit fast. I am adding two attempts at correcting this. Please let me know which one you think is correct. The corrections are all in this file (new link May 28, 2011). 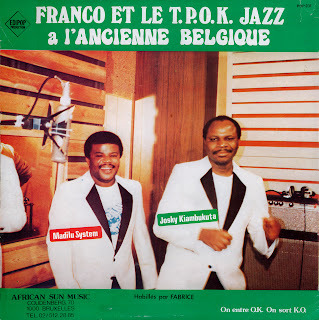 It was Ntesa Dalienst who made us aware of the fact that Franco was playing in the opening track of this classic album by the Tout Puissant O.K. Jazz. Until then we had assumed that he was not involved; an assumption that seemed to be confirmed by the absence of a composition by the Grand Maître himself. 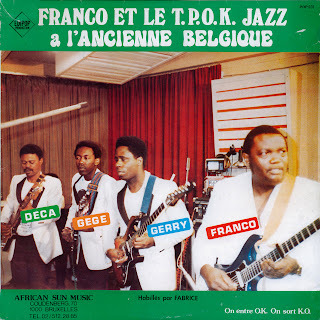 Contributing to this assumption was the growing awareness that many of the guitar bits which are generally labelled as "Franco's guitar" are in fact Thierry Mantuika playing like Franco. In fact, Franco is playing right from the start, and brilliantly too. In the first song his guitar is on the right, and in the three other songs it is on the left. I have to add that he does not play until after 2'46 in "Nda-Ya". Many critics consider this lp, which was released in 1984, to be one of the best of the T.P. O.K. Jazz. And I think there are many reasons to support this. For one, the top three vocal heavy-weights of the 1980s O.K. Jazz are present in all the songs: Josky Kiambukuta, Ntesa Dalienst and Madilu System. Secondly, there is no weaker song in this album. And there is certainly variety in the styles of the four songs. The opening track is a composition by Josky. The title "K.S.K." is an abbreviation of ""Kasongo Sefou Kitima", which is the name of a person. As Josky explained in 1991*, he composed the song during a visit to Kenya in 1983. In that year, after playing in Brussels in May (see my earlier post), the orchestra went to the US for a short visit. On their return to Brussels they were invited to perform in Kenya. They spent one month in Nairobi before returning to Belgium, where the album "A L'Ancienne Belgique" (referring to a concert-hall in Brussels) was recorded at the Studio Madeleine. Unlike the majority of Josky's compositions "K.S.K." is not a song about love. It is - as he put it - a song about life: you work well, you're a nice person, you help people, you help your friends, but still there are people who are against you. 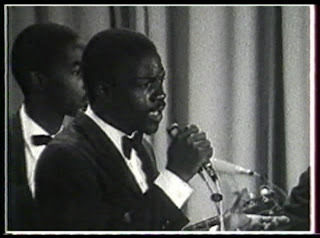 "Nda-Ya", composed by bass player Mpudi Decca, is also a name, but of a woman. As Ntesa explained, the song is about a man who is in love with a woman, but his mother has told that he should marry Nda-Ya. When the marriage with Nda-Ya does not work out the man blames his mother. The lyrics are in Decca's dialect of Kikongo, Kitandu, - which is remarkable as Ntesa was born in a family speaking another Kikongo dialect, called Kisingombe. The B-side opens with what is perhaps Madilu's most famous composition with the O.K. Jazz, "Pesa Position Na Yo" (which is - I am afraid - not saying much, as he composed only two songs with the orchestra...). Madilu performed this song at nearly all the concerts in the following years, but usually with other singers backing him. 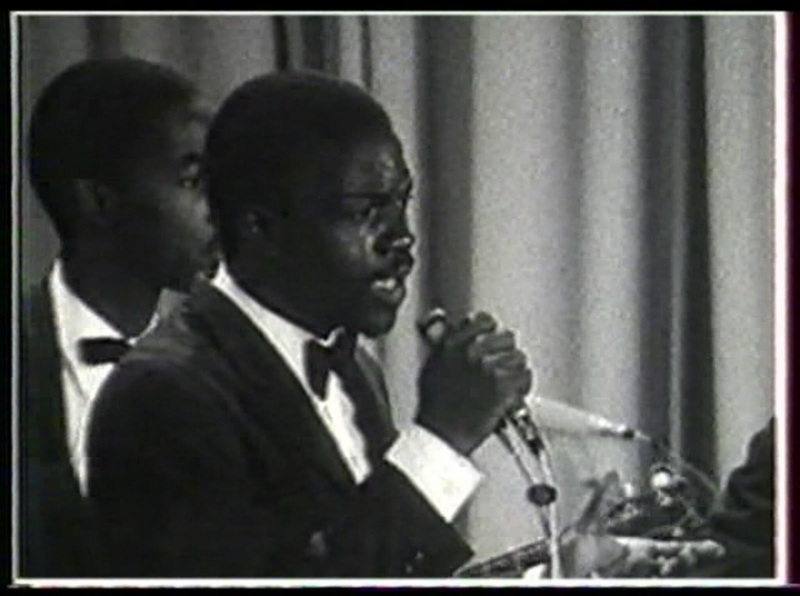 In this video from 1986, for example, by Kiesse Diambu, Aimé Kiwakana and a very young Malage de Lugendo. Personally I prefer this original version, with the solid backing by Josky and Ntesa, and the understated and subtle guitar playing of Franco. Fittingly, in the last track, "Mukungu" composed by lead guitarist Gerry Dialungana, none of the three singers has a lead role (although in the O.K. Jazz terms Ntesa - as the one with the highest voice - sings the first vocal). Instead the instrumentalists dominate this song. And, of course, this means that Franco is allowed to 'do his thing'. He does so brilliantly, gradually pulling out all the stops after about 7 minutes, with some inimitable shuffles. In case you are still wondering which guitar is Franco's: he is on the left (I recommend using headphones). Because the lp is still in mint condition I am adding a version in the FLAC format. This is only available for a limited period, until March 4. *You can hear Josky's comments in Aboubacar Siddikh's posting on YouTube of this album.